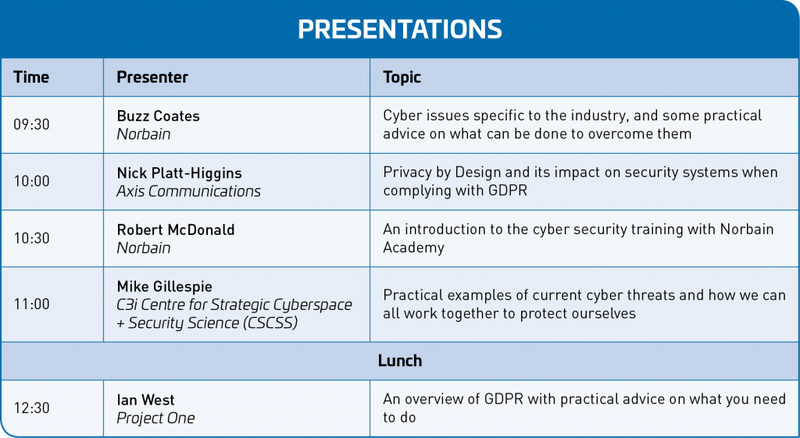 The Norbain North Roadshow is being held again in May 2018, this time with accompanying seminars on Cyber Security and GDPR – two interlinked subjects that are key for everyone involved in the industry and beyond. Our key suppliers will be showcasing their latest innovations from our CCTV, Access Control and Intruder portfolio. As usual, they’ll be holding on-stand demonstrations and be available to discuss your projects and requirements. Norbain’s Field and Internal Sales teams will also be available to guide you round the event. The impact of cyber security is becoming increasingly apparent. By 2021 some experts predict that cyber crime damage will hit $6 trillion annually and has been described by Ginni Rometty, CEO of IBM, as “The greatest threat to every company in the world”. New GDPR regulations are coming into effect on 25th May and effect the way in which we take accountability for consuming and storing information. Penalties for non-compliance are high, so companies need to be sure they understand and meet the guidelines. Fortunately, Norbain has pulled together a range of experts who can provide additional information on these subjects. We’re delighted to welcome our keynote speaker Mike Gillespie to the event to talk about the issue of cyber and the associated threats to the industry. Mike holds multiple titles in the cyber space, including Managing Director & Co-Founder of Advent IM and Vice President of the C3i Centre for Strategic Cyberspace + Security Science (CSCSS). Mike also serves as the Cyber Security lead for the surveillance cameras guide from the UK Government’s Surveillance Camera Commissioner. Andrew Pigram, Bosch – Are your internet connected devices properly secured? Please use the below form to register for this event. If you have any questions, please speak with your Norbain Account Manager, or contact the Norbain Marketing Department at marketing@norbain.com.